A wonderful rendition of old time blue pixie sticks. Our eliquid juice is 100% hand crafted right here in Indiana, USA. They come freshly mixed, made to order, in a variety of blends and strengths. 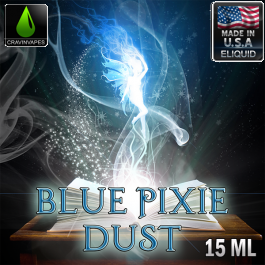 Please select the mix ratio & nicotine strength options to customize your eliquid order. Our eliquid is made with the highest quality flavors and ingredients and thoroughly tested to ensure they will satisfy your taste buds and nicotine cravings. All our eliquid or juices have a great amount of flavor. Since our eliquids are mixed fresh when you order, it is best to steep your eliquid before use. All orders ship out within 24 hours of order time excluding Sundays. If you have any questions, comments, or concerns please send us a email via our contact page.